This is the story of my husband’s favorite recipe. Ever. 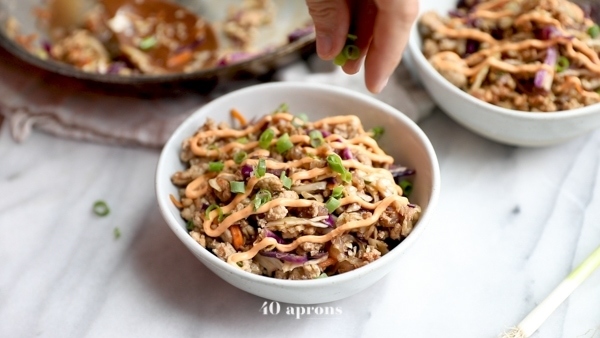 So, my Whole30 egg roll in a bowl recipe, complete with the life-changing creamy chili sauce, is a reader favorite and has been for ages. I get it! It’s low carb and paleo, easy to make for dinner, and so full of flavor. Personally, I feel like it belongs on every Whole30 meal plan. This “crack slaw” recipe is, pretty sure, my husband’s favorite recipe I’ve ever written. Or made, or brought into our house. And the fact that he cooks it easily is a true testament to just how easy of a low carb recipe it is. Really, this man does not cook. Any other time, though? This egg roll in a bowl recipe almost always sounds good for dinner. 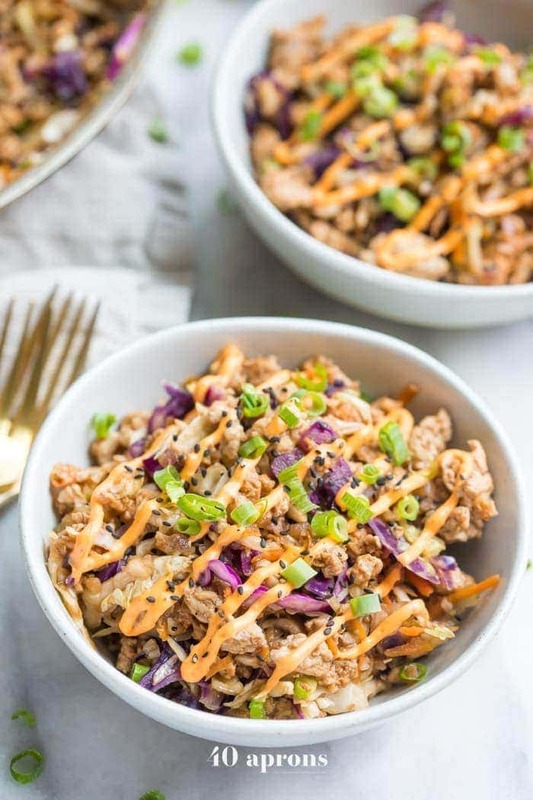 With shredded cabbage, tender ground pork, loads of sesame-y, Asian flavor in the sauce, and – get this – a creamy red chili sauce to top it all off, you and your whole fam will positively love this crack slaw recipe. The flavors of an egg roll without the unhealthy deep-fried wrapper make such a delicious Whole30 dinner recipe. Using coleslaw mix means prep is super simple. Topping it all with a spicy mayo takes this egg roll in a bowl recipe, or “crack slaw” recipe, to the next level! It’s Whole30 compliant, meaning no added sweeteners, grains, gluten, or soy. Perfect for those with allergies or who are just trying to eat healthily! 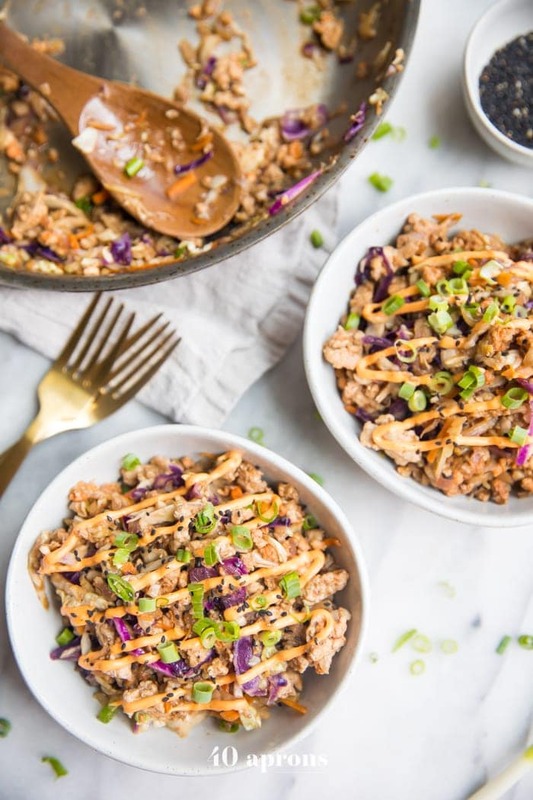 This Whole30 egg roll in a bowl recipe is made in one skillet so fewer dishes! Try broccoli slaw instead of the shredded cabbage or coleslaw mix. Many reviewers have made it this way and loved it! If you’re not on a Whole30 and tolerate soy well, you can substitute soy sauce for the coconut aminos. Make sure you’re light on the salt afterward, though. Swap the ground pork for ground turkey or ground chicken, if you don’t eat pork. You can even use shrimp in this Whole30 egg roll in a bowl recipe in place of the ground pork! Sauté the shrimp until they’re pink and no longer translucent then remove. Add them back in right before serving and toss well. This recipe makes enough to serve two with leftovers or four without. It’s fantastic for meal prep, just make sure you keep the creamy spicy mayo / red chili sauce separate. If you can’t eat eggs and aren’t on a Whole30, try a vegan mayo in place of the regular mayonnaise for the red chili sauce. Should you be on a Whole30 and are avoiding eggs, simply swap the mayonnaise for coconut cream – the solid white part of a can of coconut. Make sure you simmer the sauce down so it’s not very liquid. You want it thick and rich! Check out my Whole30 sriracha recipe for the creamy red chili sauce; it’s amazing! If you don’t have time, simply sub your favorite Whole30 compliant hot sauce in for the sriracha. Is rice wine vinegar Whole30 compliant? Yep – even though it has “rice” and “wine” in the name. Every vinegar except malt is allowed on the program. Just make sure you’re not using “seasoned” rice wine vinegar, which almost always includes sugar. 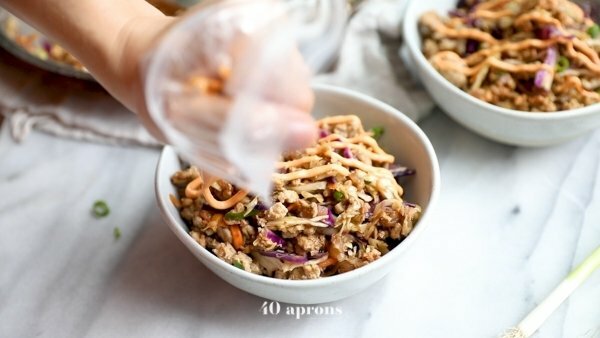 Can I make this “Crack Slaw” ahead of time? 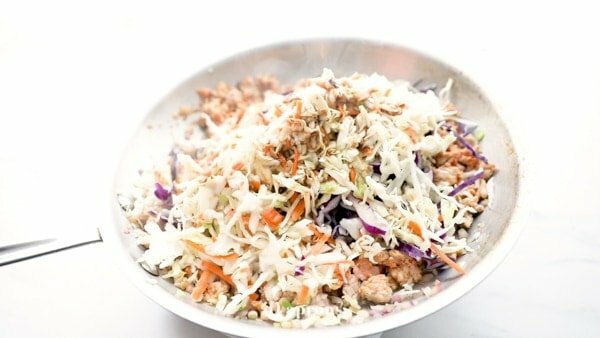 Yes, crack slaw reheats pretty well, making this the perfect dish for easy paleo and low carb meal prep. However, it’s probably a good idea to store the spicy mayo in a separate container. Really, this low carb recipe is so easy to make for dinner – check out this video to see just how to make it! First off, heat your sesame oil in a large skillet over medium heat. Then, add the red onion, green onion – white parts (!) and garlic. 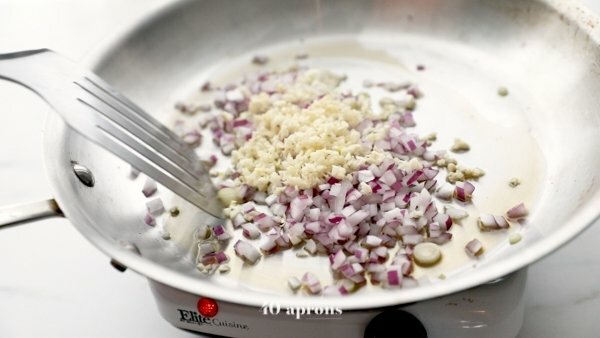 Sauté until onion is softened, about 4-5 minutes. Now, add ground pork, freshly grated ginger and 1 tablespoon of Whole30 Sriracha Hot Sauce or Chili Garlic Sauce. Brown ground pork and crumble with a spatula. Add shredded cabbage or coleslaw mix, coconut aminos, rice wine vinegar, white pepper, and salt. Cook until the cabbage is tender, stirring regularly, about 5 minutes. In a small bowl, whisk together mayo, sriracha or hot sauce, and a pinch of salt. Now, transfer to a small piping bag or plastic bag and cut off the tip of the plastic bag. 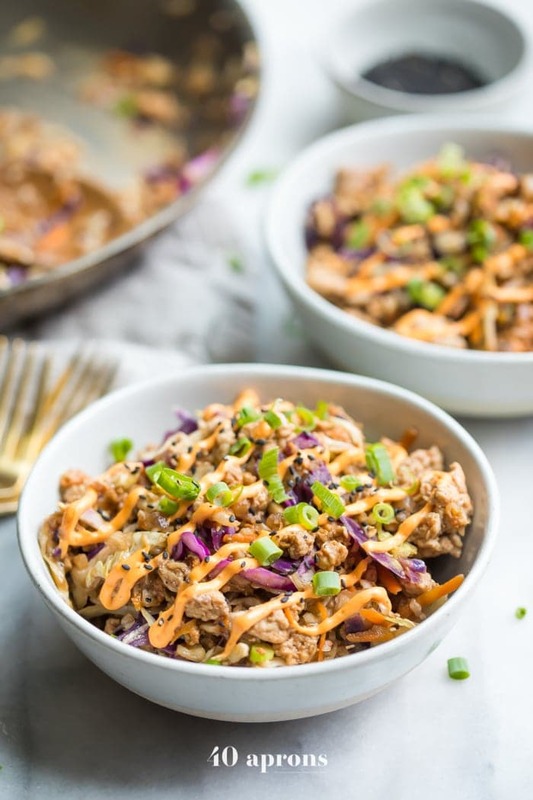 Finally, transfer egg roll in a bowl to serving bowls and drizzle spicy mayo over. As the last step, garnish with sliced green onions – the green parts! – and sesame seeds. Did you make and love this Egg Roll in a Bowl aka ” Crack Slaw”? Give it your review below! And make sure to share your creations by tagging me on Instagram! 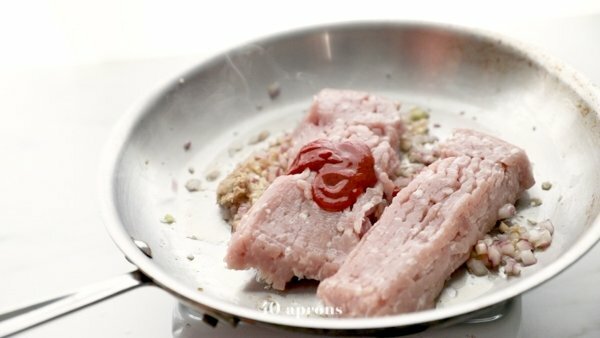 Add ground pork, grated ginger, and 1 tablespoon sriracha hot sauce or chili-garlic sauce and cook until pork is browned, broken up, and cooked through about 7-10 minutes. 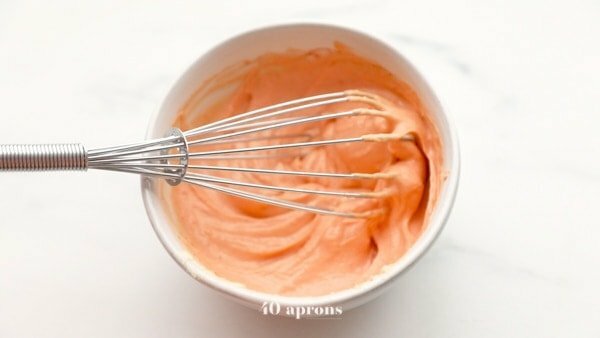 Meanwhile, in a small bowl whisk together 1/4 cup mayonnaise and 1-2 tablespoons compliant hot sauce. Add a pinch of salt, to taste. To drizzle, place creamy chili sauce in a small plastic sandwich bag. 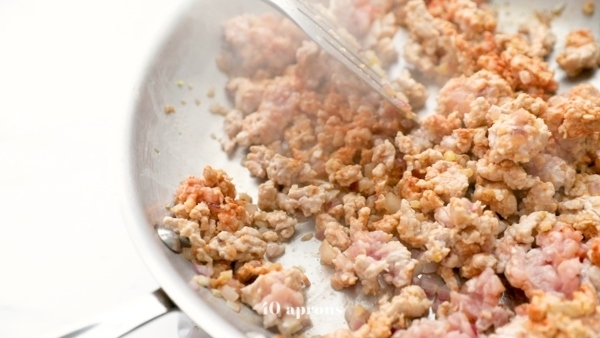 To plate: spoon a hearty helping of the pork-cabbage mixture in a serving bowl. Snip off the corner of the sandwich bag with the creamy chili sauce and drizzle over egg roll in a bowl recipe mixture. Garnish with green parts of the green onions and black sesame seeds.